This is a short biography and if you want more information you can visit the contributor's website where you will usually find contact details. If you wish us to pass a message on email us. From restaurateur to celebrity chef, Nick Nairn has had a long and pioneering career in the UK food industry. A familiar face to many due to his high-profile television appearances, Nick is equally famous for his staunch support of top quality Scottish produce, and passionate advocacy of healthy eating. Based at his stunning Port of Menteith Cook School, Nick's hectic schedule includes teaching, filming and writing, but he is also in high demand as a food consultant, and travels the world giving cooking demonstrations and speaking on food-related issues. Growing up in the gorgeous Scottish Trossachs, Nick's love of the outdoors and native country came early. But it wasn't until he answered an advert for a navigating officer with the merchant navy that his eyes were opened to the wonders of global cuisine. Returning to Scotland to study at the Glasgow College of Nautical studies, he found himself experimenting in the kitchen in an attempt to copy those exotic dishes he experienced on his world travels, and it wasn't long before a fascination with food began to develop. It was a fascination that was soon to grow into a consuming passion and in 1986 he opened his first restaurant, Braeval, near Aberfoyle. Entirely self-taught, Nick was soon causing a stir with his fresh style of cooking, and just a year after Braeval opened he won the Scottish Field and Bollinger Newcomer of the Year Award. Four years later, and Nick's status as one of Scotland's finest chefs was confirmed as the restaurant was awarded a coveted Michelin star. As his fame grew, Nick stumbled into the world of television, where his irreverent style combined with Scotland's fabulous natural produce to create Wild Harvest in 1996. Wild Harvest 2 and Island Harvest were soon to follow, all with accompanying books, and these programmes have now been enjoyed by millions of viewers around the world, from Sweden to Zimbabwe. Other shows have included Who'll Do The Pudding, Back to Basics, and Nick Nairn and the Dinner Ladies, for which he won a Glenfiddich award in 2004. From 2006 until 2007 he took part in three seasons of the Great British Menu, winning the Scottish round in season one, and making it through to the final of the programme. Ultimately, he was voted in by the public to cook the main course at the banquet for Her Majesty, The Queen's 80th birthday. Most recently, Nick joined the long-running rural affairs programme, Landward, his first show where he wasn't cooking for the cameras. The series, which was re-launched in 2007 with Nick at the helm, investigates topical countryside issues such as climate change and land usage. 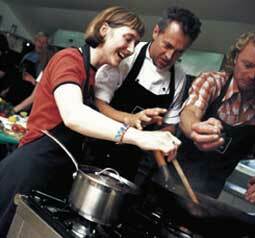 But the programme he is probably best known for is Ready Steady Cook, which he has co-presented since 1996. A desire to spread his knowledge of cooking good, simple food brought about the opening of the Nick Nairn Cook School in April 2000. 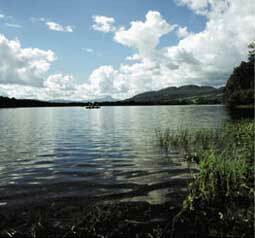 With its idyllic setting on the Lake of Menteith, the school soon built up a well-deserved reputation as a foodies' heaven, and in 2004 it was completely re-developed, re-opening as one of the leading cook schools in the world. With state-of the art kitchens, the school has facilities for up to 24 students to enjoy hands-on cooking. Pupils also benefit from of an unprecedented level of tuition from Nick and head tutors John Webber and Alan Mathieson, as well as the chance to experience fantastic ingredients from some of Scotland's finest producers. The school is also supplied by the adjacent organic vegetable garden, managed by Nick's wife Holly, and boasts a stunning restaurant-style dining room, a wood burning pizza oven, and even a smoke house, where the chefs produce their own organic smoked salmon. In the same year he opened his Cook School, Nick also established Nairns Anywhere, an event catering business boasting restaurant quality food in any location. In 2001, catering giants Compass group acquired Nairns Anywhere to provide the highest level of food and service in the prestige catering sector. Nick recently became much more involved with the company, and it is now run as a joint venture. In 2007, Nairns Anywhere took over the hospitality catering at Stirling Castle, further increasing its visibility and influence on the Scottish catering industry. Through his food consultancy business, Nick Nairn Enterprise, Nick is also kept busy with his cooking demonstrations and public speaking duties. He travels across the country and around the world educating and entertaining thousands with his animated and highly enjoyable performances. 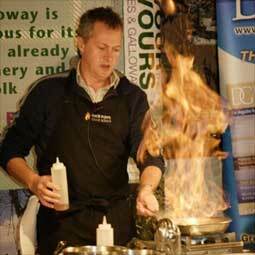 Nick is passionate about Scotland's fabulous larder. He uses every possible opportunity to promote his passions; his burning ambition being to make his fellow Scots enthusiastic about the wonderful natural produce that surrounds them.